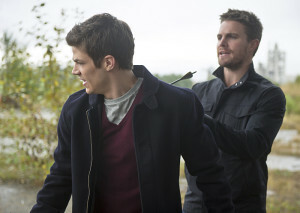 Home / News / “Flash vs. Arrow” Overnight Ratings: Looking Good! “Flash vs. Arrow” Overnight Ratings: Looking Good! The initial overnight ratings numbers for “Flash vs. Arrow” are in, and it’s looking quite encouraging, especially when you consider the final number could go up even more. Last night’s epic crossover episode of THE FLASH was the series’ most watched (4.22M) episode since the second week of the season (10/14), and tied for its best A18-49 (1.5/5) rating since week two. It was its highest-rated episode in A18-34 (1.3/5) since its third episode on 10/21. THE FLASH had its second best M18-34 rating (1.6/7) of the season, behind only the series premiere, and its best M18-49 (1.9/6) since 10/14. THE FLASH was tied for #2 in the hour in A18-34 and ranked #1 in M18-34. Week to week, THE FLASH was up +22% in total viewers, +18% in A18-34, and +7% in A18-49. At 9pm, Supernatural rose +3% over last week in total viewers (2.36M), and was steady in A18-34 (0.8/3), and A18-49 (0.9/3). The CW had its most watched Tuesday night (3.29M) since the Flash series premiere on 10/7, and was up +14% over last week in total viewers, +10% in A18-34 (1.1/4) and +9% in A18-49 (1.2/4). Versus this same week last year, The CW’s Tuesday night is up +39% in total viewers, +10% in A18-34 and up +9% in A18-49. What did you think of the episode? Come talk about it on our forum! Don’t forget Part 2 of the crossover airs on Arrow tonight! Photos from that episode can be found here. Previous: Flash: “The Man In The Yellow Suit” Promo & Screencaps: Reverse-Flash Is Here!